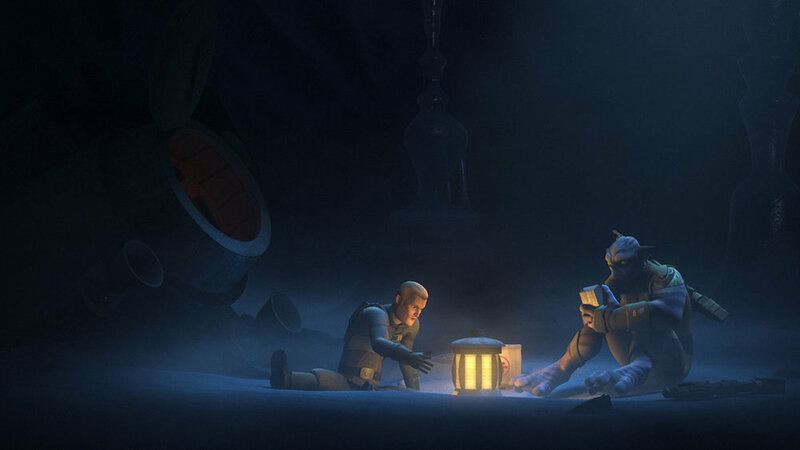 The Honorable Ones Zeb and Agent Kallus find themselves stranded on a frozen moon near the planet Geonosis after an Imperial ambush attempt goes awry. While stranded, the two warriors form a special bond. I enjoyed the 1985 film Enemy Mine. In the film a human space pilot was stranded with his mortal enemy, an alien played by Louis Gossett Jr.. It was a fun film that explored the commonalities that warriors share. The Honorable Ones is similar and does a great job at fleshing out the past of both Zeb and Kallus. It is the added depth to the characters and especially Kallus that makes this episode work. What happened to all the life forms on Geonosis? We know, because of the comics, Episode 2, and the end of Episode 3 that the Death Star was constructed there (or at least partially constructed), but it was fun to see that mystery swirl around the Rebels as they try to make sense of it all. I am sure we will come back to this story line in the future. The simplicity of the episode is also what makes it enjoyable. By having the show focus mainly on the perceptions the two warriors have of each other the episode is able to delve into fun territory. I was very surprised how sympathetic I found Kallus. Lost Stars, the book written by Claudia Grey, did something similar by making those serving the Empire multi-dimensional and sympathetic. I like that. I appreciated how several sequences, especially the one where Kallus tells Zeb about the fate of Lassan, deepened the character of Kallus. This was the type of episode that will pay off big later because it gave us such strong character development. As the episode came to a close you could not help but wonder if Kallus is going to turn to the Rebellion and join them. His experience with Zeb has clearly shook him to his core. If the show runners go in that direction it could be a fun story arc. I liked the final shot of the episode as Kallus sat alone in his quarters pondering what had happened to him. Other than a been there done that feel (because of similar stories like the film Enemy Mine) not much. The bad guys fail yet again, which is getting old, but it is sort of expected now. Overall, I loved the episode and feel that things are moving quickly toward a wonderful final stretch of episodes.